On Saturday, 3rd October, Tarvin Tennis Club held its rearranged annual Junior Tournament. It turned out to be a keenly contested competition played under a round-robin format. 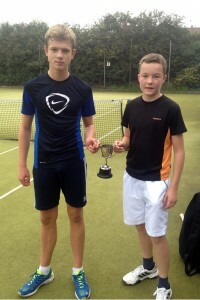 There was a disparity in ages amongst the players so it was no surprise that two of the older players, Olly Roberts and James Pond, contested the final. James, who was last year’s winner, won a very close match although Olly had two or three opportunities to win. Coach, Gary Ward, and chairman, Rob Millar, were impressed by the quality of play and sportsmanship of all those taking part and the younger players acquitted themselves very well. The only disappointment was that there were no girls participating and it must be a target for the Club to encourage more girls to take part in competitive play.